Interfacing the non- is a gesture of resistance against the dominant story in the dichotomous structure of nature/culture, digitality/humanity, technics and other materialities. The mixed media installation elaborates on the artist's long term research on cotton and its inextricable colonial entanglement in the phantasms of modernisation, technological development and the factor of production. Weaving text and textile, breathing and cotton are the threads of Knobel's recent practices, which are anticipations of a new subject form. The lasered text on woven cotton are now covered by transparent silicone, which glistens on the surface. 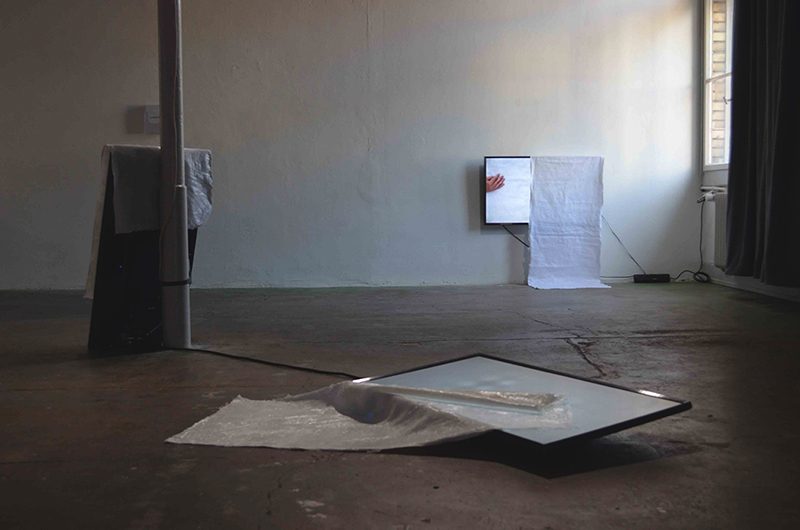 With the silicone-cotton as background, three hand choreographies on flatscreen monitors seemingly reflect our daily movements, yet, the perseverant gestures manifest the being in progressive time and space dimensions. The relations created here are seeking transits, formalizing a state of remaining self-unfinished. A manifestation for the quasi-public situates the performance’s estimation in an active process of degeneration while proposing to see ourselves in the perspectives of our lungs. 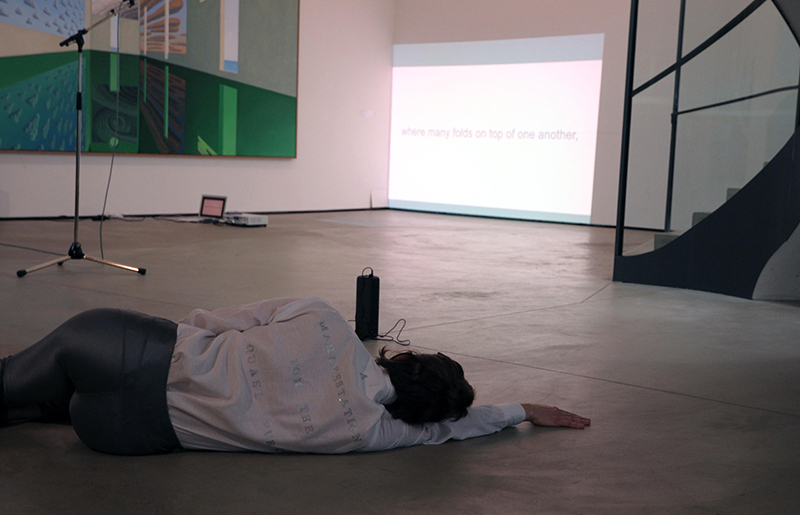 Stefanie Knobel (*1983) is an artist and choreographer working between performance, writing and installation. Her recent performances and installations are internationally presented at 24/7 - Friday Milk (RU), FRAC Lorraine Metz (FR), 6. International Moscow Biennale for Young Arts (RU), Aargauer Kunsthaus (CH) Künstlerhaus Bremen (DE), Helmhaus Zurich (CH), Britto Arts Trust (BGD), etc. Knobel's work is mostly based on bodily and linguistic practices, alongside geopolitical dynamics, scrutinizing the means of production, performativity and the public sphere. Her choreographic approach is dedicated to realizing life and non-life situated in the different stories beyond capitalism. This embodies a material formalism like her performative breathing practice and her precise gestural layouts. Her body of work materializes zones of conflict as possibilities of the hitherto unthinkable and is propelled by a critical re-metaphorization of "human" processes such as technology, labor and pharmaceutics.